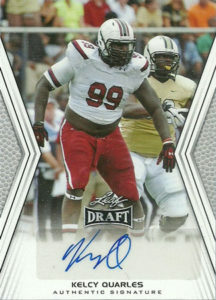 Defensive tackle Kelcy Quarles played college ball for the Gamecocks of South Carolina from 2011-2013. He posted 66 solo tackles, 39 assists, 23.5 tackles for loss, 13 sacks, 1 pass defended, and 1 fumble recovery over his time at the school. He was expected to be drafted somewhere around round 5 or 6, but fell out of the draft entirely and became a priority free agent. Signing with the Giants after the 2014 Draft, he’d be claimed off of waivers by the Patriots and placed on their practice squad. The Colts signed Kelcy from the Patriots- but found himself on and off the regular roster the remainder of the season. He’d be waived in 2015 and returned to the Patriots practice squad later in the year. Then he’d be cut, and returned again to the Colts, where he played the rest of the season. Although he did not make the final roster of the squad in 2016, he’d be on and off the practice squad throughout the rest of the year. In his brief NFL career, Kelcy played in 2 games making 1 tackle, 1 sack, and a pass defended. Quick rant. So I went into Walmart, and they had these great little hangar packs called ‘Walmart Autographed Memorabilia’. Like the Target cousin, I’m not expecting much. I get 5 packs of cards and an autograph AND a patch card. For 15 bucks- yeah okay- it works, but when it is hanging on the $9.99 rack: Two please! That’s what led me to my problem. They weren’t hanging there because they were priced at $9.99 each. They were there because somebody ignorantly hung them there. Needless to say the store manager refused to give me the $9.99 price point, so I refused to buy any of them out of principle. Later I came back to the store and found them hanging again on the $9.99 rack.